Recently an internet friend of mine wrote a small piece on her blog addressing two things about her anti-depressants that truly resonated with me. … so much to say. Except, well, not. So, hey, let’s talk about anti-depressants, since I suspect that’s why I don’t have a whole lot to say. Honestly, I feel like I could have written that entire statement. I am not here to do either of those things, so don't quit on me yet. Anyway, though I seem to be aimlessly floating around in this ambiguous cloud of writer's block, there really IS so much to say about so many things in my life. Not the least of which are my medication and how it has transformed my life; Little G's SPD diagnosis and how we are struggling with that and learning more about it every day; how much I wish I could talk to my former self about all of this - my medication AND Little G's struggle - so that I wouldn't have felt so lost, defeated and judged (I was actually convinced that I was less of a mother than women who's hard times with their kids seemed easier than mine were) and how my beautiful, little baby girl is no longer a baby. There's so much to say; but aside from this small snippet, I can't seem to say much about any of it. Almost like the medication has whisked away the need to process things in favor of just not having anxiety or thrill over things in the first place; like my mind, which used to be full of thoughts both hauntingly dark and brilliantly bright with every vivid color in between, is now a vast, murky, gray swirl - like trying to grab a fleck of dust out of a water glass where every time you get closer, the dust flits away. And I too am starting to realize that the "post-partum" designation of my anxiety and reactivity is set to expire soon if it hasn't done so already. I'd be more concerned over that, but I'm on medication. So where does that leave me? I am unsure. This space has always been first and foremost a place for my voice because I do have things to say and I have always needed a place to process 'out loud' in a creative way. But if there's nothing to process, or rather, if there's a LOT to process but I just can't seem to 'get there', than is this space really necessary? I don't know the answer to this and I have no sense of conviction either way. But I did at least have the words to process this here, so perhaps there is hope for this voice in the gray. This is what I think about: "But if there's nothing to process, or rather, if there's a LOT to process but I just can't seem to 'get there'".... is there nothing to process now that the extra anxiety isn't there, or is it just that I can't sink deep enough? And if it's that I can't sink deep enough to get to it, does it matter? If I didn't blog, would I have even noticed? 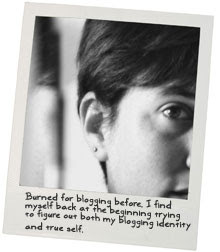 And since I blogged because of the depth of my sinking, am I really losing anything by not blogging?